Or in Jim’s case, a lack thereof or plan to, as he explained to Waters in a piece that published today. Well, that seems to settle that. And I also refuse to believe that this line was delivered at anything less than a 7 out of 10 on the “Is Jim irritated?” scale. Regardless of the tone or volume he delivered it, though, it seems clear that Boeheim’s around for the long haul. Waters also asked him about any potential timeline related to Buddy’s four years at Syracuse and he denied there’s any plan in place. All of this is probably fine, of course. Boeheim addresses the former three-year timeline that was in place prior to Mike Hopkins’s departure, and talks about how that was used against Syracuse by opposing coaches vying for the same recruits. So even if there’s something in place — and I don’t think there’s anything formal at this point — I doubt he’ll talk about it for risk of hurting the program’s ability to attract talent toward the tail end of that timeline. But at the same time, Jim is 74 years old and already the oldest active coach in college basketball. Coaching another three or four seasons would put him among the oldest coaches in the history of the sport. 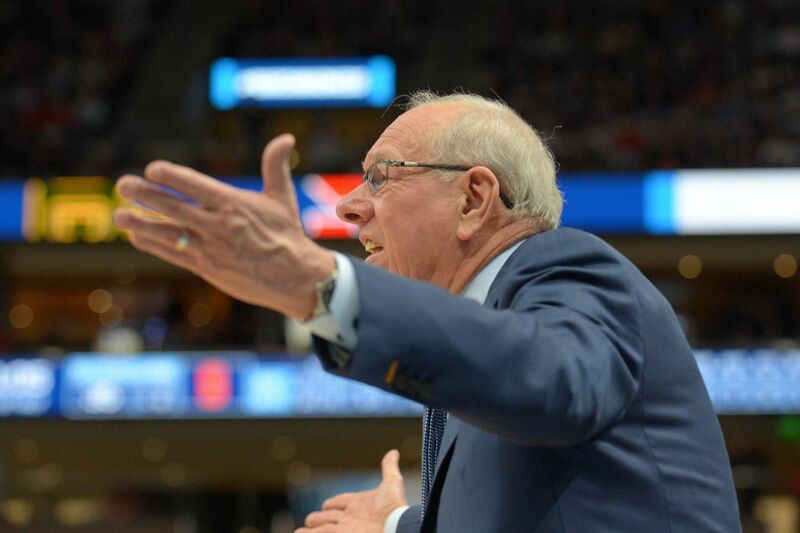 At some point, it’s not a question of whether he “has to” leave or not, but whether he wants to spend the rest of his productive life on the Syracuse basketball sidelines... and to be honest, he might. For now, we could be alright with that. While the last five years have been pretty rocky, there’s some built-in reasons behind all of that: NCAA sanctions, conference change, surprising program attrition, adjustments to how the game’s played with regard to three-point shooting. Even with all of that in mind, Boeheim’s still managed three NCAA Tournament trips, a Sweet 16 and a Final Four. It doesn’t excuse the regular season struggles, but at least helps us feel better about them. With the full allotment of scholarships going forward, there’s at least a good chance we’re able to move past the list of frustrating, 14-loss regular seasons and get back to something resembling what we’re used to: perennial contention for a top-4 seed in the NCAAs and some modest designs on competing for a conference title. If we don’t, and remain a bubble team (or worse), then there’s a more substantive conversation to be had about the state of the program and Jim’s role in that. The 2019-20 season starts that process of evaluating “where things are going” by way of how Boeheim and the roster deal with departures, and improving the ghastly offense of recent vintage. We don’t know what the future will hold, but Jim’s going to shape it one way or another. In the meantime, we’re just going to wish he’d talked to Mike about “Avengers: Endgame” and enjoy the photoshops that come with that. You should’ve logged onto Fandango earlier, Jim! That’s how you got caught with no Endgame strategy.